Midweek visit. and it was very quiet except for the TV which the barman was watching. A group were having a quiz in the back part and had to ask for the TV to turned down. It was, by about 2db. Only beer on was Blacksheep at �2.00 a pint. 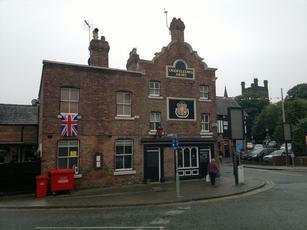 This is a really friendly traditional pub in the heart of Chester! selling good quality beers including a guest cask (which is rare nowadays). At the weekend it transforms into a very lively busy pub. This pub just seems to be getting better and better every weekend! The staff and landlords are there to welcome the regulars everyday and new customers. I know there are several groups that come from miles to Chester just to go to this pubs. Highly recommended. I love it. Please disregard all previous comments about this pub, since being taken over by the present landlords, the pub has achieved a remarkable transformation, both in it's interior decor and the majority of it's "Odd" clientelle! Paul and Carl have managed, in a short space of time, to change most aspects of the pub and it is now one of the "must visit" pubs in Chester, certainly if you like a pub with a lively, friendly atmosphere and good beer at reasonable prices. Well worth revisiting if you have not been in for a while, I guarantee you will be impressed y the change. This pub is now under new management! It has a friendly atmosphere with lots of regulars throughout the week. Also has more going on than it has for years, and it also had a reputation for closing at the drop of a hat. Now Monday is quiz night again, Tuesday - darts, Wednesday -Wii night & Karaoke (very busy) Friday and Saturday nights! We also have cask ale back on and shortly we will be starting food. I suggest you come back in and give it another try ;0) add us on facebook too!!! 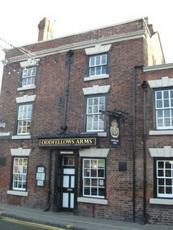 The oddfellows arms Chester.